The lightweight capability and high safety standards of The Recaro Easylife makes it one of the best in its category. It’s a great, affordable, and stylish stroller for any parent and their baby. Very lightweight and compact when folded. The canopy has plenty of ventilation. The harness is padded and very secure. The storage basket is not particularly large. You have to practice folding and unfolding a bit. 7 THE BOTTOM LINE | A Recommended Investment! Why the Recaro Easylife is the stylish and affordable stroller you need in your life. In terms of child stroller safety, this model is excellent. Brakes are really firm on this stroller and you can easily engage or disengage them by stepping on them. If you press on the brake which is located on the right wheel, the stroller will stand still. The one which is placed on the left wheel will make the stroller mobile again. Brakes are really firm on this stroller. The Recaro Easylife is perfect for seaside holidays. The stroller has a very useful canopy that will shield your child from the sun because it has UV SPF 50+ protection. The coverage is excellent on the upper part of the stroller but it might not be enough for smaller children. There is also a small window on the top of the canopy so you can take a peek every now and then in order to ensure that everything is alright with your little one. It has magnetic clasps which are super silent and you will not wake your child up while opening the canopy window. The Recaro Easylife stroller is made for children older than six months. The seat can be reclined and adjusted easily without too much hassle. So you will be able to make napping very comfortable for your little passenger as soon as he or she falls asleep. The seat itself is quite spacious and it is excellent for tall children because they can put their feet on the leg rest. It is located right in front of the seat. Recaro Easylife has a five strap harness and your child will be secured tightly in. The buckle is very easy to unlock so be aware of that. If your youngster loves to play with a buckle, they might be able to find a way to get out of it. Of course, we have to address the handle since parents do need to feel relaxed while pushing a stroller. Recaro Easylife has a single handlebar that cannot be adjusted to fit their height. But don’t worry – it is positioned high enough so even tall parents will be able to push it without any problems. The handlebar is coated with foam which is excellent. Foam is way more suitable than rubber but it is definitely more sensitive. It is prone to tearing so make sure you take a good care of the handlebar. And since this is a foldable stroller, the lock mechanism is located in the middle of the previously mentioned handlebar. It might feel a bit strange, but it will not affect the overall performance of the stroller. The handlebar is coated with foam which is excellent. Recaro Easylife is super lightweight. 13lbs carriage is amazing for traveling as well as for pushing the stroller down the street. You will be able to notice a huge difference, especially if you owned heavier strollers in the past. The basket is located underneath the seat and it can be reached easily. However, it will hold all of your essentials you need throughout a day. A cup holder is an extra feature and it is located on the handlebars. It is firm and can hold a bottle of water or a cup of coffee. A cup holder really is a nice addition and it is super convenient for parents. The basket is located underneath the seat and it can be reached easily. You will have access to all of your things even when the seat is reclined which is excellent. The size of the basket will not amaze you but have in mind that this is a foldable stroller so you can’t expect plenty of storage space anyway. When it comes to the way it performs outside, this stroller has six wheels in total and four-wheel suspension. Therefore, it can glide over various obstacles you might encounter on your walks. It will hold well as long as the surface is flat. It is a lightweight stroller so it might not be suitable for rough terrain. However, playgrounds, parks, and sidewalks are perfectly fine. …this stroller has six wheels in total and four wheel suspension. 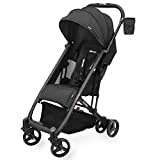 On the manufacturer’s website, the suggested retail price (MSRP) is $200, which is a great price point for a quality stroller. As we have previously mentioned, you can fold this stroller with only one hand. It is very convenient for families living in smaller apartments, or for parents who use public transport on a daily basis. Once you fold it up, it will be able to stand on its own which is great. Buy right now on Amazon, and have it delivered right to your door! (Check it Out!). Another excellent feature is the fact that the seat will fold inward. Therefore, the fabric will remain protected and will not get dirty or dusty. Unfolding this stroller is very easy. All you need to do is place your hand on the handlebar, pull the mechanism, and the stroller will be ready. Surely, this might seem super complicated to parents who are not used to working this mechanism and yes, you have to practice a bit at first. You’ll be able to master the technique pretty quickly so don’t worry. And it should last for years of use. Unfolding this stroller is very easy. THE BOTTOM LINE | A Recommended Investment! Even though Recaro Easylife is an umbrella stroller, it can easily rival the full-size models with the super comfortable and spacious seat that will make your little passenger feel cozy and secure. This stroller is an excellent solution if you lack storage space in your home, or you often travel with your family. If can be folded into a square and will fit every car. Recaro Easylife is designed with sporty and active parents in mind, but everyone can use them because they are practical, very lightweight, and can be folded up it in just a couple of seconds. The design is very modern and you will be able to choose from a variety of bright and eye-catching colors.